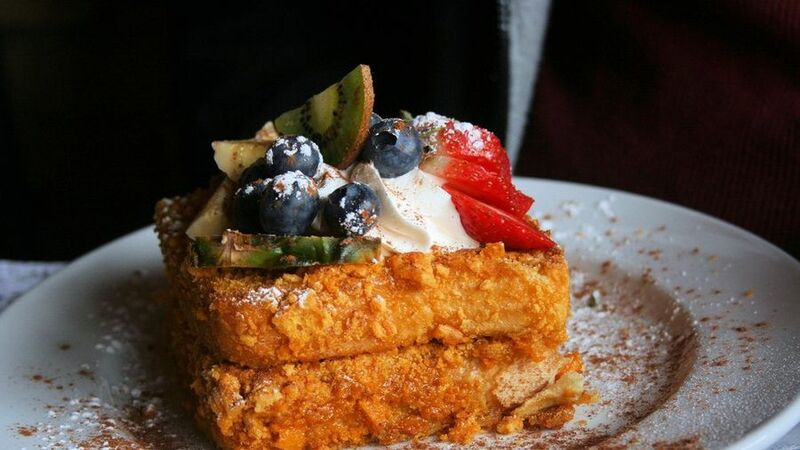 Today is National French Toast Day, celebrating the sweet syrupy carbo-loaded breakfast treat. But did you know that in Brazil and Portugal, French toast is actually a Christmas dessert? It is commonly served with butter, syrup, fresh fruit, sugar or cinnamon (or, if you’re like me, all of the above!). Another interesting fact is that French toast is no more French than French fries. Instead, it gets its name from restaurateur Joseph French of Albany, New York. Mr. French, Americanized the dish in the 1700s and aptly named it after himself. Now, here we are, 300 years later, with a breakfast meal that you’ll see at nearly every restaurant in America. A few months ago I was watching Diners, Drive-Ins, Dives on Food Network when I came across this amazing recipe that I just had to share with you today. I hope you and your customers enjoy it as much as my family did. It’s got a little bit of childhood memories mixed in which will appeal to even your oldest customers! Mix cream, eggs, sugar, and vanilla in large bowl with a Piano Whisk. Put cereal in a storage bag and crush with a rolling pin until it resembles cracker meal. Transfer to large shallow dish. Dip bread into cream mixture until soft (not soaked). Let excess liquid drip from bread, then press into cereal to evenly coat. Place on Sheet Pan. Repeat with remaining slices of bread. Heat a large skillet or griddle on medium heat. Add butter and cook bread until caramelized on both sides (6-8 minutes total). For whipped topping: Beat ingredients together except berries until soft peaks form. Dollop on top of French toast and serve with berries! Today is National Pickle Day. Pickles are an incredibly versatile vegetable- dill, sweet, bread and butter, gherkin, kosher dill, sour, brined, Polish, Hungarian, lime, even deep fried and Kool Aid Pickle often accompanying sandwiches. Have you ever been to Zingerman’s Deli in Ann Arbor, MI? They serve the freshest and tastiest pickles I’ve ever encountered. In honor of this tasty day, serve pickles with everything! Pickles and pasta, pickles and steak, pickles and …. lol well whatever! They are tasty delight! Although time constraints will not allow you to make authentic dill pickles and serve it today, here’s a quick recipe by Rachael Ray that uses ingredients from your refrigerator and can be prepared in less than 20 minutes. Enjoy! Heat small saucepan over medium high heat. Add vinegar, sugar, mustard seed, salt, and garlic to the pan and cook until it begins to simmer and sugar dissolves. Toss the dill, bay leaf, and sliced cucumbers together in a heat-proof bowl. Pour the simmering liquid over the cucumbers and stir to evenly coat. Allow to cool to room temperature or chill before serving. Pies and cakes are a thing of the past! Cupcakes are the latest craze to hit the food world. Food Networks Cupcake Wars is a great example of this fad- an entire show devoted to the creation of unique, decorative, and tasty cupcake treats. Years ago your choices were chocolate or vanilla, but today cupcake varieties are endless. Bacon and Maple-Glazed, Lemon, Pumpkin Spice, Oreo….. The list can go on for quite some time. Yet, today is National Vanilla Cupcake Day. A day in which we pay homage to the original and perhaps most simplistic flavor. While other flavors will come and go, Vanilla Cupcakes are a time tested tradition. You’ve probably had a zillion different vanilla cupcakes in your lifetime, and yet each recipe tastes a bit different from the next. Today, on your menu add Vanilla Cupcakes to your dessert menu as a special treat for your customers. Years ago, I found this recipe in Bon Appetit Magazine and fell in love with its moist and delicious flavor. It may be a bit more complex than your average recipe, but it’s definitely worth the effort! Bring coconut milk to boil in large deep saucepan over medium-high heat (coconut milk will boil up high in pan). Reduce heat to medium-low; boil until reduced to 1 1/2 cups, stirring occasionally, 25 to 30 minutes. Position rack in center of your Blodgett Single Deck Gas Convection Oven. Preheat to 350°F. Line eighteen 1/3-cup muffin cups with paper liners. Whisk flour, baking powder, and salt in medium bowl. Set aside. Using an Immersion Blender, beat butter in large bowl until smooth. Add sugar; beat on medium-high speed until well blended, about 2 minutes. Add 2 eggs, 1 at a time, beating well after each addition and occasionally scraping down sides of bowl. Beat in seeds from vanilla bean and remaining egg. Add half of flour mixture; mix on low speed just until blended. Add 1 cup reduced coconut milk; mix just until blended. Add remaining flour mixture; mix on low speed just until blended. Divide batter among muffin cups. Bake cupcakes until tops spring back when gently touched and tester inserted into center comes out clean, about 20 minutes. Transfer cupcakes in pans to rack; cool 10 minutes. Carefully remove cupcakes from pans and cool completely on rack. Using electric mixer, beat butter in large bowl until smooth. Add sugar, 1/3 cup reduced coconut milk, seeds from vanilla bean, and salt. Beat on medium-low speed until blended, scraping down sides of bowl. Increase to medium-high and beat until light and fluffy. Using pastry bag fitted with large star tip, pipe frosting onto cooled cupcakes. Sprinkle with coconut. DO AHEAD Can be made 1 day ahead. Store in airtight containers; chill. Bring to room temperature before serving. Today is National Cappuccino Day! It’s a good thing this holiday is today because with the change of time, lots of us are waking up a lot earlier than we’d like. There is not better way to start your morning or end your evening than with a cup of hot and frothy cappuccino. It’s quite easy to go over to Starbucks or your local coffee shop and order a cappuccino anytime of day. But what I do find difficult is finding a restaurant that offers the drink. You know, after a deliciously prepared meal your body craves a cappuccino, so you ask your server to bring you a cup of that frothy goodness only to find out they don’t offer it. Don’t let your restaurant make that mistake. Burkett Restaurant Equipment carries a large selection of new and used cappuccino machines that will give your restaurant that edge. Check out this amazing Grindmaster 110V Espresso Cappuccino Machine. It will bring the enchanting flavor of European Espressos straight to your serving table, with fully automatic dispensing for easy operations. No more struggling with confusing, bulky, hard-to-read units, this innovative espresso maker comes in a user-friendly design, with touch pad controls and a LED display for added convenience. Create an elegant leaf with the cappuccino milk to really impress your customers. With a little bit of practice, it’s not too difficult to perfect! Don’t use a cup with a straight side, but rather one that is curved as you need the milk to flow up and out from the edge in a nice curvy manner. If the sides would fit comfortably into your hands if you held it in both hands without using the handle, then that is a good shape. Start out by pouring the milk directly through the espresso so that it pierces the crema. Aim from the center of the cup towards the edge. Once the milk starts coming back up through the espresso from the edge, move the flow to the edge where the milk is coming up. Move your wrist from side to side while also moving to the opposite side of the cup. While doing so, also make the side to side motion narrower and narrower to form the tip of the leaf pattern. It’s probably safe to say that your restaurant offers some sort of sandwich. Sandwiches are one of the most popular lunch items in the U.S. and around the world since they are an easy and quick way to grab a bite to eat. The variety of sandwiches are endless. Let’s see, there’s Cuban Sandwiches, French Dip, PB&J, Panini, Grilled Cheese, Bologna, Falafel… wow I could probably go on for a while. If you think about it, any dinner can be transformed to a lunch sandwich- put leftover spaghetti between two pieces of garlic bread and now you’ve got a spaghetti sandwich. The same theory applies to meatloaf and carved turkey leftovers. Today, in honor of National Sandwich Day impress your regulars with a new and unique sandwich like this tasty Eggplant Parmesan Sandwich! Fill a large bowl of warm water and stir in salt until it dissolves. Slice the eggplants crosswise using a knife about 1/4 inch thick (keep slices consistent) Completely submerge in salt water and let stand for 1 hour. Remove eggplant from water and shake off excess moisture. In a shallow dish, whisk eggs, salt and pepper. Spread the breadcrumbs in another shallow dish. Dip the eggplant in the egg wash and then the breadcrumbs, covering all surfaces. Line a baking sheet with paper towels. Lightly coat a 14″ Stainless Steel Frying Pan with olive oil and allow it to heat up over medium-high heat. Add eggplants to pan, cover and cook until translucent (about 5 minutes). If eggplants become too dark, reduce the heat. Using a large spatula flip the eggplant and cook until completely tender (1-2 minutes more). Transfer eggplant to paper towel. Repeat with all eggplant slices. Warm hoagie buns in oven for 5 minutes. Divide eggplants evenly on the rolls, top with marinara and cheese. National Peanut Butter Lover’s Month! Take a peek in your kids’ Halloween candy bag and I’ll bet you’ll find many peanut butter candies in there. Yea, you can get your sweet fix eating a Reese’s Peanut Butter Cup, but if you’re a true lover of peanut butter, you need something a bit more satisfying to satisfy your craving. While this holiday is probably more of a salute to the sandwich spread, peanut butter is a versatile ingredient. You’ll often find it stuffed in sandwiches, covered with chocolate, or used in desserts, but you can also use peanut butter as part of an entree! Use it as a meat marinade or toss it with noodles and scallops for a dish your customers will love, so add to your menu a delicious peanut butter dish this month like Beef Satay with Peanut Butter Sauce. Combine lemon grass, coriander, cumin, salt, pepper, sugar, 3T thick coconut milk and ginger. Mix with meat and let marinate for 1 hour in the refrigerator. Skewer meat on 12″ Winco Steel Skewers. Broil in oven for 4-6 minutes depending on how well cooked you prefer your meat to be. Heat oil in a 12″ Aluminum Frying Pan on medium heat. Add curry paste and stir constantly for 2 minutes. Add milk and let boil for 1 minute. Add remaining ingredients and simmer for 15 minutes or until thick. Serve warm with meat skewers!